A shrinking economy has led to fewer drug and alcohol treatment options in Puerto Rico. The island is a High-Intensity Drug Trafficking Area (HIDTA) due to its location in the Caribbean and status as a US Commonwealth–allowing contraband to be transported to the mainland with much less scrutiny than foreign imports. This has resulted in high crime rates and the abuse of illicit substances, especially Heroin. With little government funding dedicated to substance abuse treatment or recidivism, the Department of Justice estimates that 17.9% of drug charges in Puerto Rico are Heroin-related. Due to its current economic crisis and $70 billion in public debt, the Puerto Rican government has been unable to do much to curb its drug problem (or any of the issues stemming from it, such as: government corruption, high crime rates, and public health crises). However, there are still treatment options for those struggling with addiction, with approximately a dozen detox centers and 4,400 residential treatment facility beds available to the island of 3 million. An estimated 8.2% of Puerto Ricans have a history of illicit drug use. Heroin and other intravenous drugs have devastated the island of three million. There are an estimated 60,000 intravenous drug users on the island, coupled with the highest infection rates of HIV and Hepatitis C in the western Hemisphere. Of the total number of HIV/AIDS transmissions, 42% were caused by injection (as opposed to the 21% transmission rate in the continental US). Additionally, eight in ten inmates in Puerto Rico have Hepatitis C, as illicit drugs have become available behind bars while needles are harder to come by. Among the general population, 67% of all hospital overdose admissions are Heroin-related. Due to decades of drug trafficking, Puerto Rico has strict laws surrounding the possession and distribution of illicit substances. Possessing Marijuana, for example, in a recreational area can result in a 10-year prison sentence. The government has enacted an anti-crime “iron fist” policy on drugs, hoping to crack down on the concurrent trafficking of firearms and homicides (Puerto Rico once ranked sixth worldwide in murders per capita) plaguing the island. Although Puerto Rico legalized medical Marijuana in 2015, it is still illegal to smoke Tetrahydrocannabinol (or THC, the principal psychoactive in Cannabis) in any form. Nonetheless, there are over 4,000 registered patients with medical Marijuana ID cards (with another 7,000 waiting), able to purchase from dispensaries beginning January 2017. 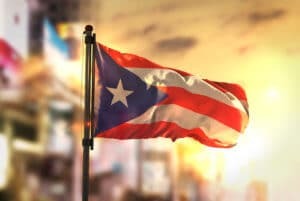 Out-of-state cardholders are able to purchase in Puerto Rico, but must obtain a Puerto Rican medical Marijuana license prior to making any purchases. Puerto Rico divides illegal substances into five categories based on their potential for abuse, their level of accepted medical use in the US, and the lack of accepted safety for use of the drug under medical supervision. Drugs in Schedules I and II are considered highly addictive with little to no medical use, while drugs falling in the lower Schedules have more medical use and less chance for addiction. Possession of any amount of a scheduled narcotic (and some non-narcotics) is a felony. Penalties for drug possession are below. Prison times and fees vary depending on criminal history, the court’s decision, and participation in Puerto Rico’s Drug Courts. There are fewer treatment options available on the island of Puerto Rico due to tragically low government funding and damage caused by recent hurricanes. After the damage caused by Hurricane Maria, the staff and medical supplies needed to treat those suffering from addiction have reached historically low levels. Most detox and recovery programs run on donations and not government grants. Additionally, one study of the island’s public funding reveal that spending priorities focused more heavily on punishment than treatment and rehabilitation. Puerto Rico doesn’t allow the distribution of the anti-opioid drug, Narcan, used to revive patients who are overdosing. Also, only a couple of centers on the island offer detox medications like methadone or Buprenorphine to wean users off heroin. For El Punto, which serves the poor towns west and south of San Juan, conditions post-Maria mean employees have scaled back their trips and the number of needles they give out. Though 60% of Puerto Rico’s population rely on Medicare for health insurance purposes, there is a severe lack of public health treatment and detox centers. Iniciativa Comunitaria and the Salvation Army-Suena La Esperanza are free or low-budget harm-reduction treatment centers available to the public. Various faith-based groups from mainland America also visit the island to offer aid to addiction sufferers as well. Those seeking addiction treatment may consider finding recovery centers on the United States mainland. Out-of-state treatment centers may be better able to provide for the needs of those battling serious or long-term addictions. Traveling for treatment fully separates the patient from his or her addiction, allowing them to heal without the stress of familiar triggers and completely focus on his or her recovery. If you need help overcoming your addiction and want to find a treatment center that’s right for you, contact a dedicated treatment expert today.